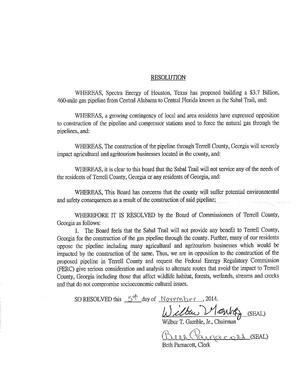 The Board feels that the Sabal Trail will not provide any benefit to Terrell County, Georgia for the construction of the gas pipeline through the county. Further, many of our residents oppose the pipeline including many agricultural and agritourism businesses which would be impacted by the construction of the same. Thus, we are in opposition to the construction of the proposed pipeline in Terrell County and request the Federal Energy Regulatory Commission (FERC) give serious consideration and analysis to alternate routes that avoid the impact to Terrell County, Georgia including those that affect wildlife habitat, forests, wetlands, streams and creeks and that do not compromise socioeconomic cultural issues. SO RESOLVED this 5th of November, 2014. When I called Terrell County Clerk Beth Parnacott today, she replied with the full submission, which includes this cover letter by Chairman Wilbur T. Gamble, Jr. FERC didn’t include the cover letter in the filing visible to the public. 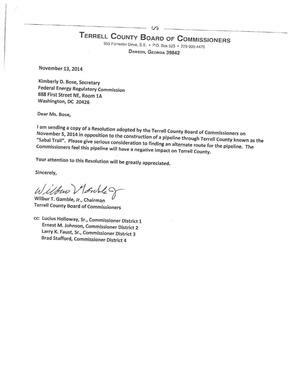 That’s the third omission by FERC recently, after they lost the second page of Dougherty County’s resolution and misplaced the lack of need, false pretense, and duress page of Bill Kendall’s letter. Maybe this last omission wasn’t substantive, but those other two certainly were. What else is FERC inadvertently not posting for the public to see in their ecomment system? Meanwhile, other county commissions can do what Dougherty and Terrell have done: pass a resolution against the pipeline. Or, even better, pass a binding land-use ordinance. And you can ecomment to FERC or contact your local, state, or national elected officials and the news media and your neighbors and express your opposition to the Sabal Trail pipeline.